Carrots and garlic – a simple set of products to create a snack. Try different recipes of this dish with sour cream, nuts and mayonnaise, delicious homemade sauce, or make a vigorous carrot salad in Korean. Simple carrot salad can be made easier by replacing the sour cream with low-fat yogurt or, on the contrary, more calories by using mayonnaise. In the second case, reduce the portion of salt. Peel the carrots and coarsely grate. Crush garlic cloves in a special press. Connect the two main ingredients of the salad in one bowl and mix well. Sprinkle the snack with salt and pepper, cover with sour cream and stir again. Soak the dish in the refrigerator for an hour, then serve. Dry walnut kernels in the oven and mash in a mortar or coffee grinder. Mix grated carrots with crushed garlic, ground walnuts, mayonnaise and pickle with salt if necessary. Products to prepare the sauce should be room temperature so take them out of the fridge 40 minutes before cooking. Chop the carrots on a coarse grater, together with the garlic. Prepare the salad dressing, this whisk the egg with a mixer, gradually pour in the vegetable oil. Add the lemon juice, mustard, thyme, ginger, sugar and black pepper. Stir the mixture until homogeneous, then tuck her vegetables and the sunflower is a good choice. - 1 tsp of balsamic vinegar. 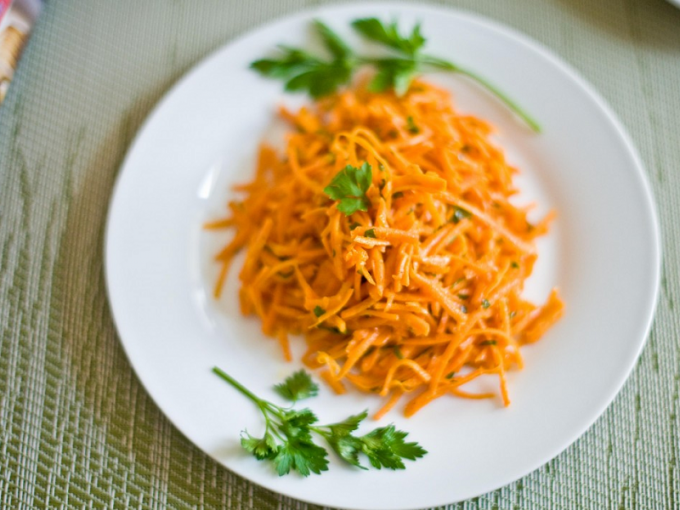 Take an ordinary or a special grater for Korean salads and make strips of carrot. Heat sesame or vegetable oil in a saucepan, quickly fry it in a mixture of vegetables and peppers, and minced garlic. Simmer 3 minutes, subtract the heat to low, remove from heat and immediately pour over the carrots. Close the lid and shake several times. Drizzle salad with balsamic vinegar and stir.